The rumors of a coordinated production cut between OPEC and Russia continue to grow more serious. The latest comes from the Russian energy minister Alexander Novak, who insisted that Russia will hold talks with OPEC in February on a possible agreement to reduce output. “There are very many questions, on checking cuts, from what base to count from. In order to start working through these issues, we need general agreement, it’s too early to talk about that. That’s the subject of the meeting and discussion (in February),” Novak told reporters, according to TASS. Oil prices skyrocketed on Wednesday and Thursday after the comments from Novak. During intraday trading on January 28, prices shot up by more than 8 percent. By midday, WTI and Brent fell back a bit, but were still up more than 3 percent. That is the highest level since the first week of January. Coordination on production cuts between OPEC and Russia has always been a long shot, and probably still remains an unlikely development. The big difference this time around, though, is Russia’s change in tone. 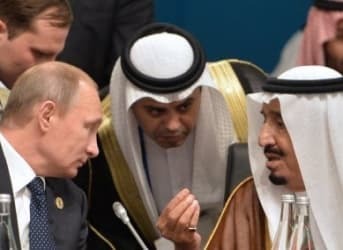 Saudi Arabia had hinted at its willingness last year to undertake a 5 percent production cut if Russia did the same, but up until now Moscow never really took the idea seriously. On January 26, however, Russian oil executives met with Russian government officials in Moscow to discuss their predicament. Reuters reported that the meeting resulted in an openness, if not complete agreement, to begin talking with OPEC about cooperation. "At the meeting there was discussion in particular about the oil price and what steps we should take collectively to change the situation for the better, including negotiations within the framework of OPEC as a whole, and bilaterally," Nikolai Tokarev, chief of state-owned oil pipeline company Transneft, said according to Russian media outlets. Russia’s oil production hit another post-Soviet record in December, climbing to 10.8 million barrels per day (mb/d). There seems to be a newfound openness from many different oil producers to look at ways of stabilizing the market. Sub-$30 oil tends to do that. Iraq’s finance minister told Reuters on Wednesday that his country would be willing to participate in talks on production cuts. However, don’t get too excited. Shortly after the comments made from Russia’s energy minister, some OPEC officials shot down the speculation. Four OPEC officials said that they had no knowledge of a February meeting, insisting that the next OPEC summit was still scheduled for June. Moreover, even if Russian officials are open to discussion on cuts in output, they face serious obstacles on following through on actual reductions. Russia’s main oil fields are already facing natural decline, and many in the industry would balk at throttling back on production. Also, there are technical obstacles. Russia is largely unable to reduce output in winter months. Yet another obstacle is Iran. Iran has shown a dogged determination to return to the oil market, with pledges to ramp up output by 500,000 barrels per day in the near-term. It is hard to imagine Iran being willing to slash output just as it finally has reached its goal of ridding itself of sanctions. To complicate matters even further is how to measure what a 5 percent production cut would look like. What is the baseline? 5 percent below what level? Production levels for OPEC members are constantly shifting, and some have even made significant gains as of late. For example, Iraq managed to increase output by 300,000 barrels per day between October and December, hitting a high of 4.3 mb/d by the end of 2015. A 5 percent cut would merely bring it back to October levels. That would be less painful than, say, a 5 percent cut in Venezuela, which saw a slight erosion of output over the same time period. In other words, until something more concrete emerges, the speculation of a coordinated production cut between OPEC and Russia is just that: speculation. Your text is purely speculative. The world is catching on to the US game and will adjust accordingly. Any cut will drive up prices because they are relative to the present. OPEC and Russia should cut their production by 10 Mbps. Think about what that would do to the world markets and economies not to mention oil storage. After 4-6 months of that OPEC would truly have control with a balanced oil price of about $50 per barrel. I hope for your sake they don't think of that. OPEC cuts may soon be moot...depletion and falling production are inevitable...took longer than many thought, and will take longer to reverse.